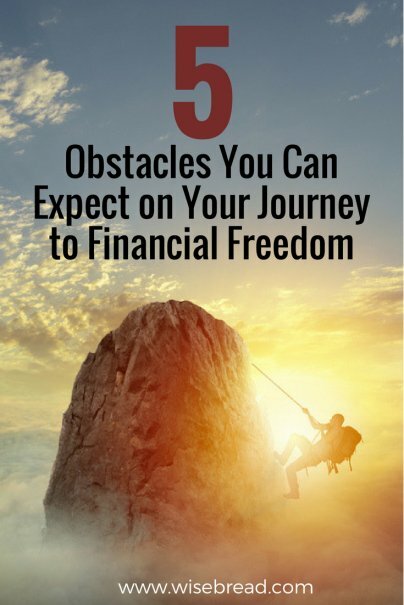 Here are a few pitfalls you can expect to run into on your way to financial freedom, and what you can do to cope. Living a life of frugality can be exhausting. Always pinching pennies, weighing options, tracking expenses, and telling yourself "no" can get old quick. Your ability to remain on the financial straight and narrow is directly proportional to your level of tolerance. Some people can go months without new clothes, drive the same hoopty for years, take one vacation every decade, and be perfectly happy. Others cannot. Find a pace and intensity that fits your personality and level of discipline. Give yourself the wiggle room you need to succeed. Forging a path toward financial freedom goes against the grain of our current society. You are bombarded with messages that tell you that you deserve the best no matter the cost. You are worth it. And you only live once, so you might as well live it up now. You are encouraged to indulge yourself. Living a lifestyle contrary to the popular consensus can be extremely lonely. It can be hard to find people who support your money management value system. And not having someone you can talk to and who understands the dilemmas that come with financial freedom can leave you feeling isolated. You may even find yourself tempted to abort your mission and follow the crowd. Before you give up and join the ranks of the financially irresponsible, consider this — you are not alone. There are others like you out there. If you're surrounded by those who do not share your passion for financial independence, you must look for those who do. The number one thing to absolutely count on during your quest for financial freedom is setbacks. They will come. Sometimes they come in packs. The important thing is knowing that they will happen and how to recover when the wagon crashes and the wheels fall off. As soon as you have painstakingly saved and set aside $500 in your emergency fund, you will have a $700 emergency. These kinds of setbacks can be demoralizing and can quickly deplete your energy and drive. However, setbacks — even the ones you cause — don't have to completely derail you and end your journey. You have to go into your journey fully aware that you will encounter unexpected surprises, unplanned emergencies, and occasionally fall victim to good ol' lack of discipline. Instead of trying to avoid them, you should work on becoming adept at contingency planning. Not falling down is an impractical goal. Getting up quickly is where your focus should lie. Another incredibly frustrating pothole you'll encounter is that of conflicting financial information. The longer you are on the journey, the hungrier for information you become. You begin to have questions and want to ensure that all your efforts are properly focused. This is a good thing. The issue you'll find yourself running into quite frequently is that often, financial experts don't agree. Some tell you to pay off your mortgage as soon as possible, while others say it's financial suicide. And the topic of investing can be particularly convoluted and confusing. Who do you believe? How do you discern practical advice from hoopla? As a rule of thumb, when it comes to financial advice, KISS — keep it super simple. If you don't understand it, don't do it. If it sounds too good to be true, run. You don't have to be a financial Einstein to achieve financial freedom. If you understand basic addition, subtraction, and can operate a calculator, you are good to go. One of the hardest things to do once you get going is to remain patient. Financial freedom is a slow walk. It takes regular baby steps in lieu of random leaps in order to be successful long-term. Consistency is the key. You have to do the same things over and over again to make progress. It's hard — nearly impossible — to pay off debt, establish an emergency fund, save for retirement, and put away money to purchase a new car with cash all at the same time. You have to work on things slowly and you have to make tough choices. The trick is to do what you can while you can, and everything will work out in the end.